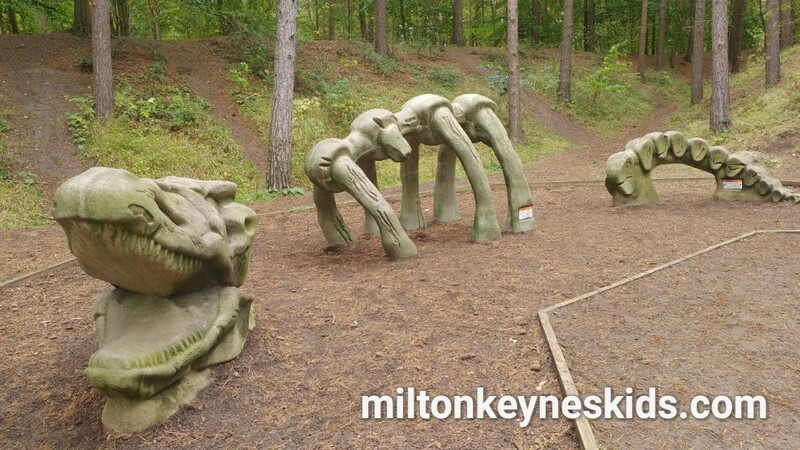 Northamptonshire as far as we’re concerned is one of the best places for country parks, and being not too far from Milton Keynes is somewhere that we frequently visit. Even if you live a bit further away then it may be worth the trip as you could probably visit several on one day if you really wanted to cram them in. Irchester Country Park has a dinosaur theme. Watch our video below to see what it’s like and then scroll down to find out what we thought about it. What’s good about Irchester Country Park? Irchester Country Park is a park set in 200 acres of woodland. It’s a big site although I have to admit we’ve really only gone for two reasons. The first is that there’s a really big playground. It has a quarry theme to it and is good fun. 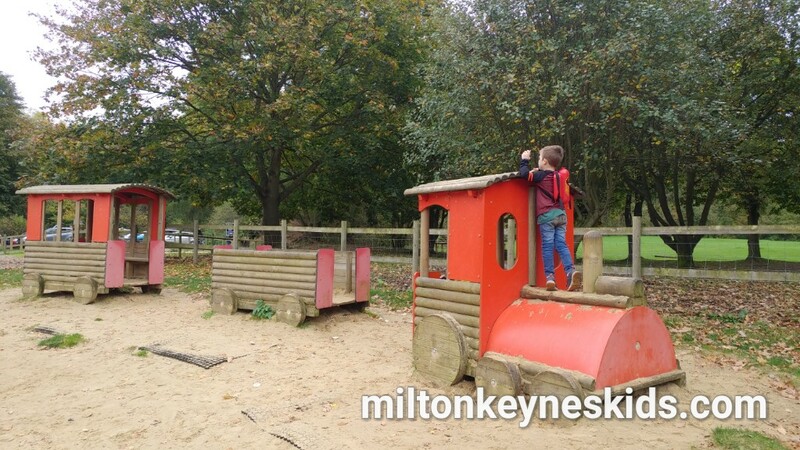 My sons – who are 4 and 2 as I write this – really like the red wooden train that they can pretend to drive as well as the sand pit – remember to take a bucket and spade in nice weather! There’s also a couple of climbing frames, a snake swing and other pieces of equipment. What’s great is that there’s so many different things it’s suitable for a range of ages. It’s quite big so you do have to keep a close eye on the children – you do enter by a gate but sometimes there’s lots of people coming and going. The other thing we really like are the dinosaur bones and eggs in the woods. There are a couple of eggs and then three parts to the dinosaurs, they make for great pictures. 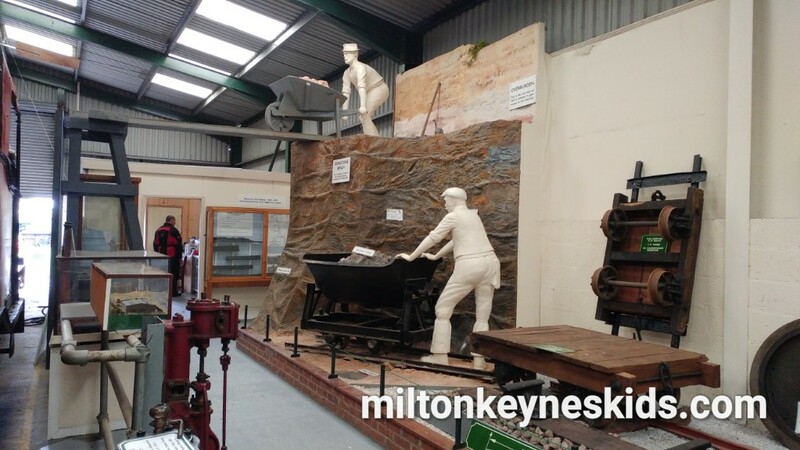 On a Sunday there’s a railway museum that you can look in for free. There’s one train the children can go in. The museum isn’t big but it’s worth having a look. There are trails you can do at Irchester – but we haven’t done them – we really should. 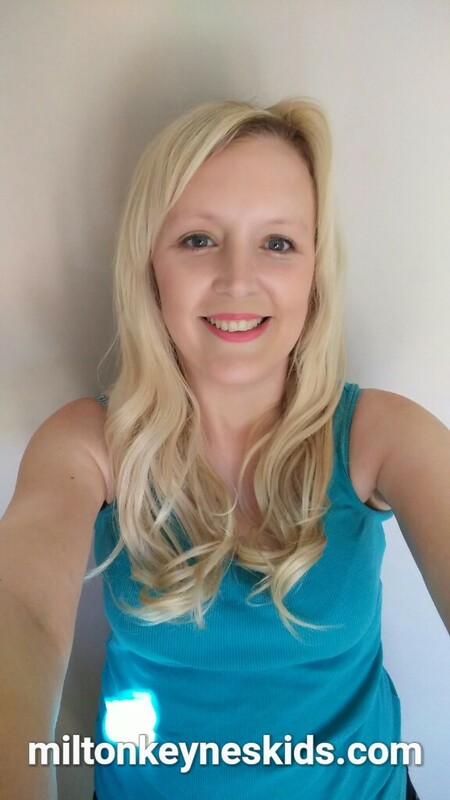 What could be improved about Irchester Country Park? 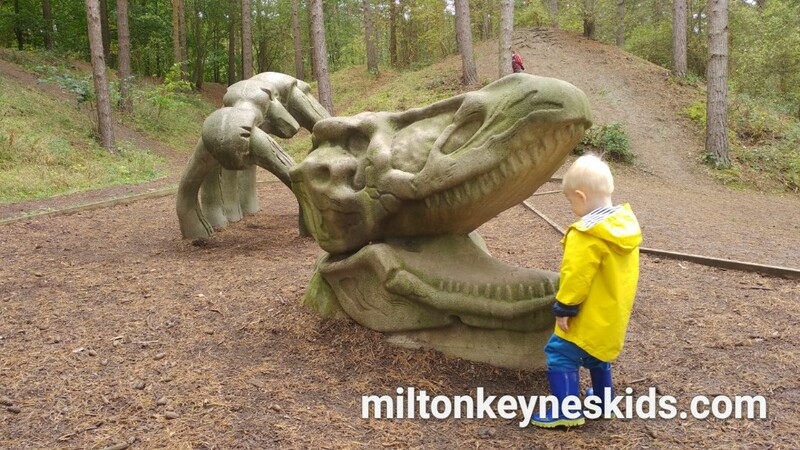 My sons loved the dinosaur bones area so much we wish there was more… it feels like there should be more! We could have walked for a mile just searching for bones. 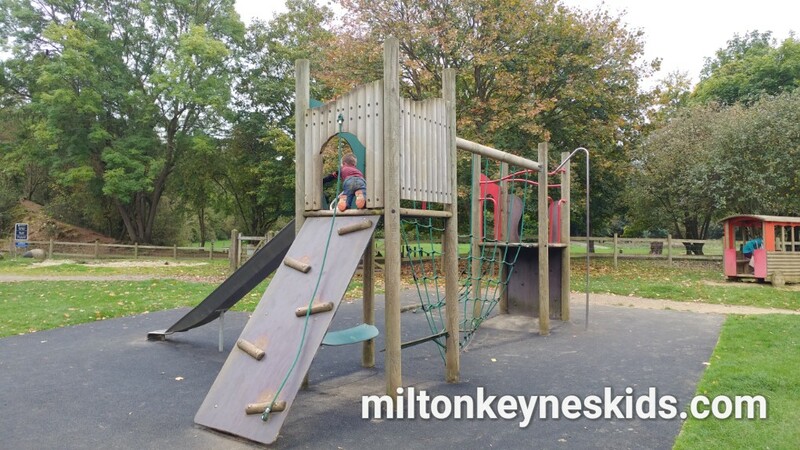 The play area is excellent, but as you would expect on popular summer days it gets really really busy so make sure you take a picnic blanket to sit on and keep an eye on the gate if your children are likely to run off. 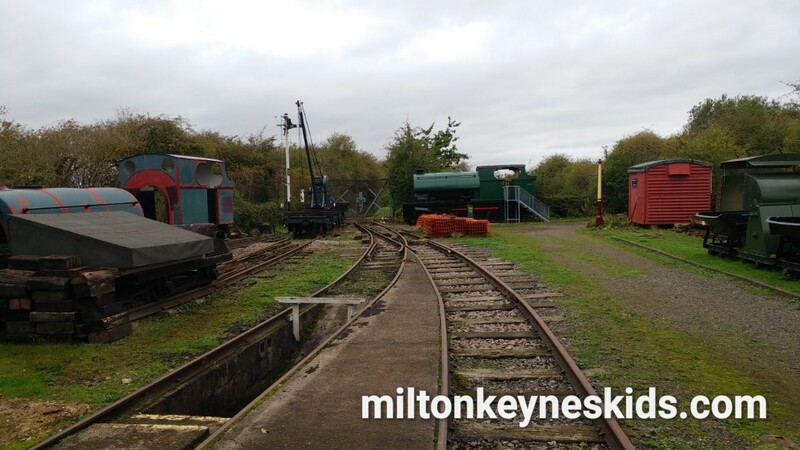 We quite liked a wander around the railway museum, although it’s a bit of shame it’s only open on Sundays – I assume it’s volunteer run. But otherwise it’s a really fun day out. Any tips for enjoying Irchester Country Park? Yes. There are two car parks. The first car park that you come to when you enter the park is immediately on the left hand side. If you do park there then you just cross over the road to the entrance to the wooded area with the dinosaurs. I’ve known of people who have visited the park and then completely missed that area. If you continue to drive down the hill you’ll come to the bigger car park which is better for the play area – you’ll just need to walk back up the hill for the wooded area. Take a bucket and spade if your kids want to dig in the sand. There is a cafe if you need to buy food, but like most places we visit we took a picnic. We’ve easily spent a few hours there, although if you’re going for walks you could spend longer. That said, one of the best things about Irchester Country Park is its location – if you do get bored of there, or have travelled a long distance then there are other fun places nearby to explore. See below. We really like Irchester Country Park… where can we visit that’s similar, or not too far away? If it’s hot then the closest place you can go is Wellingborough splash park which is open mostly weekends, bank holidays and during the Northamptonshire half terms and school holidays from 12pm – 6.30pm subject to favourable weather conditions. Check the council’s website before travelling for specific dates – it’s free. 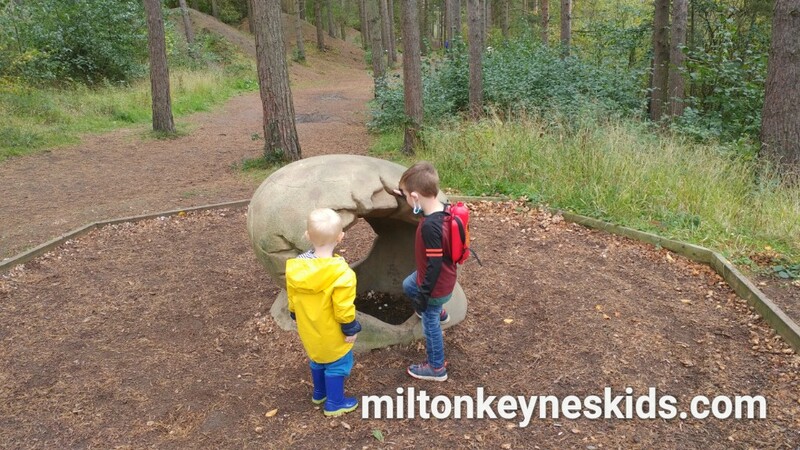 Another place we’ve recently discovered which we loved, but I haven’t yet blogged about is Rushden Lakes in Northamptonshire. It’s essentially a big shopping complex next to a lake. 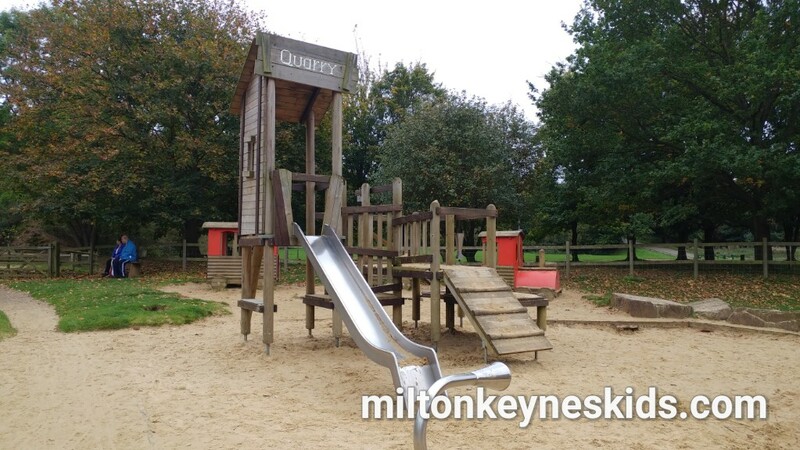 But it has a lovely play area and a good walk around the lake complete with sculpture trail and it’s free to park, you don’t pay anything else to go. Another place nearby is Stanwick Lakes – hands down it’s one of our best days out – particularly in the summer. It has one of the biggest climbing frames we’ve ever been on; adventure trail; assault course; and sand and water area. Again, you just pay to park.